What is param array in C#? What is the advantage of using param array? 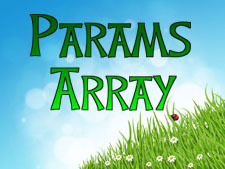 How to use param array in C# programming? Sometimes, you are not assured about a number of parameters or you want to create a method that can accept n number of parameters at runtime. This situation can be handled with params type array in C#. The params keyword creates an array at runtime that receives and holds n number of parameters. In the preceding line, the allnumber variable can holds n number of parameters at runtime because it is declared with params keyword. In this example, we are creating a function add() that will receive any number of integer parameters at runtime and returns the sum of all those numbers. We will use params array to achieve this goal in C#. In this chapter you learned about param array in C#. You also learned how to use param array in C# programming. In next chapter you will learn how to pass array as parameter.